If you want to venture into one of the world’s biggest and greatest casino sites of all time, look no further. Mr. Green Casino is built around the belief of trust and honesty. Providing some of the fastest cash out services, Mr. Green Casino is one of a kind when it comes to its lively interface and a huge range of exciting games. Mr. Green Casino holds licenses in both Italy and UK, but more on that later. It used to be open only to the Swedish market in the beginning, but since then it has started accepting other currencies such as Euro, Pounds, Krona, Kroners and CAD. Support is available in 9 languages. Many reviews will talk about the wide variety of games on this site, and that’s because the casino deals with multiple providers. Let’s see what we have to say in our Mr. Green Casino review. Mr. Green deals with a mix of providers, which is why they can offer the best of the best games to their players. There are a total of 1,000+ games in the platform, which include all the classics as well as the ones with the futuristic 3D graphics. Once you sign up, you can start playing instantly. Mobile casino is another valuable option. Jackpot slots and bonuses will make your time worthwhile. Mr. Green Casino has a lot to offer, and this Mr. Green Casino Review will go through them one by one. One of the most important features is definitely the green gaming one, which can limit your weekly gambling session. With this service, you can limit your bets, losses, and deposits for one week. Regular promotional offers and bonuses. Basically, countries, where online gambling is accepted, are accepted countries in Mr. Green Casino, and countries, where online gambling is prohibited, are the prohibited countries. This is true for almost all online casino sites, especially the ones using proper licensing. 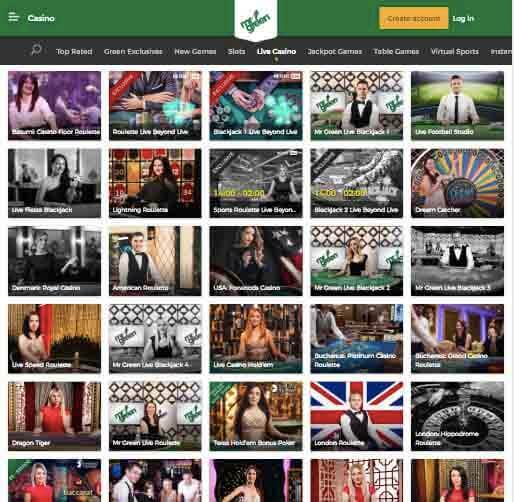 Mr. Green Casino prevents over 100 countries to play at their site, which is kind of big compared to other casino sites. It’s not possible to list down all the 100+ prohibited countries, but some of them include USA, China, Russia, Japan, South Korea, India, Spain, Denmark, France, Greece, Hong Kong etc. Mr. Green Casino is available in several European countries, including the UK. The casino provides a one of a kind experience with amazing gaming and support opportunities with the secure and safe transaction system. Software and Slots, And What Else Do We Find At Mr. Green Casino? Mr. Green Casino started its journey back in 2008, and gained popularity ever since. But the website went through a major change at the end of 2015 to enhance the overall look and user experience. The layout is a sleek and organized one, to make navigating the site easy and fast. There is a sidebar on the left side of the page, which include links to many things you might need while playing. If you click on your username, a menu drops down with options such as deposits, withdrawals, and transaction history. You also get to know your balance. You can access the banking cashier if you wish to make a deposit with only one click. The 3D graphics quality of the 3D games are excellent, but they might make the games a little slower than ordinary to load. But these can be looked past because of the outstanding graphics quality. There are so many popular options to choose from in the Mr. Green site, that you might feel overwhelmed. But thankfully, searching for a game is pretty easy. The easiest way to search for a game is to use the search function within the site. There are also tabs which break down the game section to help you browse through the categories. The categories are listed such as Top Rated, New Games, Video Slots, Live Casino, Jackpot Games, Blackjack and Roulette. If you want to play before spending any money, you can do so by playing for free in the demo mode. The games take only a couple of seconds to load, so you can start right away. There are also general information about the company, available promotions, and bonuses etc. listed over here. Mr. Green stands out from the array of other online casinos, as they have a mix of multiple providers rather than one particular software manufacturer. WagerWorks, NextGen, Quickspin, Betsoft, IGT, Microgaming, NetEnt, Play N Go, Thunderkick, Evolution, Yggdrasil, Isoftbet provide for the site. As of yet, the casino doesn’t offer any downloadable option right now. The desktop version runs on any system that uses flash, so it’s both Mac and Windows friendly. The good thing is that Mr. Green uses No-download Flash software, meaning you can access it even from a cyber café. But for the online system, the player needs to allow cookies to play. Once you are finished, you can remove these cookies. Other than having multiple providers for a huge range of gaming options, Mr. Green Casino also provides the services of Extreme Live Gaming. The live casino gaming has been taken to a whole another level with the use of unique features. Mr. Green has managed to stand out from the herd because of the live casino option with the ability to dictate actions during the game. For example, in Extreme Live Roulette, you get to win bonuses during the game with a Golden Ball option. More than 1000 fun and exciting games. Big selection of live dealer games. A remarkable mobile version with over 750 games. Wagering conditions differ depending on the locations. 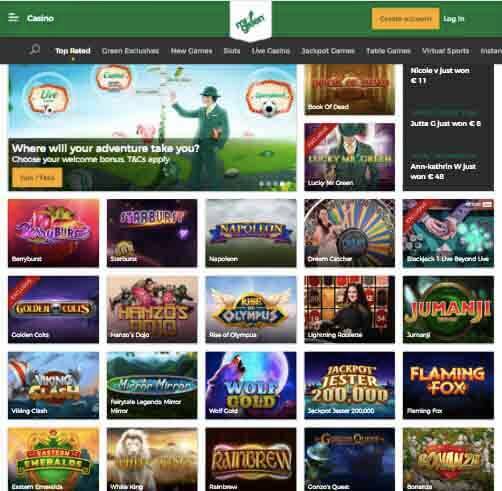 There are over 200 slot games available in the Mr. Green Casino site, in case you were wondering where to go play tonight. In the slots section, you will find the huge range of quality slot games. The slot games range from classic old school ones to modern multi-spin and multi-line features. If you get bored of the classics, choose from one of the newer ones such as the Guns N Roses slot game from NetEnt. 3D slot games such as Gonzos Quest is also available. Jackpot slots like Mega Moolah is another option. Overall, it’s hard to get bored of slot games in the Mr. Green Casino, because of the range. The multiple providers sure can keep the players interested for a long time. Exciting Bonus and Promo Offers: Mr. Green Welcome Bonus Offer 100% up to £100! Mr. Green provides a generous amount of bonuses for the first-timers. The initial bonus is a 100% match worth up to £100 on your first deposit. You also get 100 free spins on the most popular slot games, when you wager £20 or more and get 20 Free Spins during 5 days. You can win in jackpots and tournaments and win up to £3 million worth of prizes. Other than these, if you deposit at least £20, you get 100 free spins on the Mr. Green Moonlight slot game. This is a game exclusive only to the Mr. Green Casino. But keep in mind that any winnings, as well as the bonus money from the free spins, are subject to their clearing requirements. All games of the site, except for Blackjack, Roulette, Poker and the table games will not count towards the clearing requirements. To cash out the bonus and winnings, you have to wager 35X the bonus amount, or the total winnings from the free spins. You don’t need to have or use any bonus code to claim any of the bonuses, all you need is to make a deposit of at least £20. As you keep coming back to the Mr. Green site and keep playing, Mr. Green will reward you with more bonuses, which include monthly cash back and VIP programs. If you want to be a VIP member, you need to wager £80,000 or more or deposit at least $7,000 within the last two months. When you become a VIP at Mr. Green, you get access to special promotions which others don’t. Some of the special bonuses are birthday surprises, personalised support, and invitations to special events. In general, Mr. Green provides numerous types of weekly and seasonal promotions throughout the year. If you have the fear of missing out on such promotional offers, just set up reminders on your phone or google. Finally, we are going to talk about the mobile version of the Mr. Green Casino. It is possible to play even if you don’t have a PC, which is great as it means you are also capable of playing on the go. The mobile version comes with apps you can download from the Play Store and the iOS Apps Store. The app is great as it gives to access to play the casino from anywhere. All you need is a secure internet connection. If you have an Apple device, it’s better to download the app as it will greatly improve your casino experience. The live dealer games, table games, and video slots are all available through the app. You can use the Touch ID feature to ensure a secure gambling session. For the Android users, the gaming experience is equally pleasing and satisfactory. But for Android users, your device should have at least the Lollipop 5.0 option. You can also make quick withdrawals and deposits right on the app. This a very fast and secure option. You can easily track your transactions here as well. It’s possible to connect with the customer support from the app in case of any discrepancies. The search option is a quick option to find any game in a matter of seconds. The app will give you access to a fantastic range of table, slot and live dealer games. The best thing is that the games portfolio is getting bigger every day, and new games are being added every single week. At this rate, it is only a matter of time when the number of games crosses the 1000 line. It’s possible to play on the site from anywhere you want, thanks to the mobile platform which you can access from any tablet or smartphone. But keep in mind that the choices for the games are a bit limited compared to the PC version. This is because not all games are made compatible to convert into small screens. All the games which can be played on a mobile device have a mobile phone icon. There are over 750 games available in the mobile version, which is not bad at all if you ask me. We tested it out, and our Mr. Green Casino review shows positive results The mobile version of the Mr. Green Casino looks slightly different from the desktop version. So it’s important that you understand how it works. The mobile version has the categories as followed: New Games, Top Rated, Video Slots, Jackpot Games, Blackjack, and Roulette. If you want to browse through all the available games, you can go to the All Games tab. A special bonus for the mobile platform is the 200 free spins with a £100 extra cash. The Live Dealer feature was introduced back in 2013. The platform is powered by Evolution Gaming. Players get to enjoy a wide range of games with many tables to ‘Sit’ at and enjoy the game to have the feeling of the traditional brick-and-mortar casinos. High-quality video streaming and top-notch user interface are other notable features of the live casino. The video streaming quality depends on the quality of your internet. You don’t even have to leave the room to feel the real gaming experience, thanks to the amazing features of Mr. Green Casino’s live casino. A good collection of games are available in the live casino, such as Blackjack, Roulette, Hold’em Poker. This is available for both VIP and mass players. You can choose and adjust the camera angles according to your preferences. The games are streamed from Latvia. During the sessions, you can interact with the dealers directly. Mr. Green Casino offers all the standard security features of payment of all the top casinos. The system, therefore, includes a Thawte secured cashier, 3rd part audits of the game and 3 separate governing bodies. Many payment options are available, namely all the popular ones such as Visa, MasterCard, PayPal, Skrill, Neteller, PaySafe, as well as bank transfers. You don’t need to make any extra fees unless you want to request a withdrawal for more than once a week, in which case it’ll be 1% of the withdrawal sum. You can do cash out within 24 to 72 hours. In case of other types of cash outs, they’ll take 1-3 business days. The minimum withdrawal is $30 or equivalent. You can request one withdrawal per week. The currency types are EUR, CAD, USD, NOK, PLN, CZK, SEK. This depends on the payment processor but in most cases, it is at least $5. The customer support of Mr. Green Casino is so superior that it has won many awards. They have standard support options similar to the top casinos. Their customer care support really sets them apart from the other online casinos. They provide customer care support via Email, Live Chat, and phone. These are available 24/7. The phone number is +44 (0)1765522017, however, it’s not toll-free. The Mr. Green Casino is the largest company of the parent company Mr. Green and Co AB. The parent company is based in Stockholm, Sweden. The Mr. Green Casino launched back in 2008 and has been growing popularity ever since. The major changes came to the website back in 2015, when the interface and gaming quality upgraded to a whole another level. They now offer all casino games, provided by all the major providers, as well as a live casino lobby. The security of the Mr. Green Casino is top notch and better than any other online casinos. Because they are affiliated with responsible gambling partners, they can provide this. To take it a step further, they have their own site dedicated to this. They stand by the motto Green Gaming, which means you are not allowed to make irresponsible choices. The withdrawals and deposits system of the site is fair and just. Because of the Green Gaming program, they are fair. The transactions are crystal clear, which is why they practice accountability. You can reach support for any such issues for a quick fix. Mr. Green Casino is truly one of a kind when it comes to the world of online casinos. Their wide range of games, amazing interface and superior support make them stand apart from the crowd. The results from our Mr. Green Casino review show, that there are a lot of options that will engage from the very beginning. If you are a complete newbie to the online casino world, there is no need to fear. Just contact their customer support and they will guide you through. It’s a different concept, so it might take you some time to get used to it, but it’s surely worth a try.